Predictive analytics is a game-changer — it’s like “Moneyball” for… money. This article summarizes and links resources with late-breaking coverage of how predictive analytics reinvents six industries. I’m going to break it to you gently. Despite all the advanced technology lining your pocket, car, home, workplace–and even the proverbial cloud floating virtually above your head–the world is a remarkably inefficient, wasteful place. The organizations that make the world go ’round, the companies, agencies, and hospitals that treat and serve us in every which way, constantly get it wrong. Marketing casts a wide net; junk mail is marketing money wasted and trees felled to print unread brochures. Institutions are blindsided by risky debtors and policyholders. Fraud goes undetected. And, critically, healthcare could use all the prognostication it can get. These are heavy costs that tax both you and I in various ways every day. If only there were some way to run things better, to improve the effectiveness of the frontline operations that define a functional society. Predictive analytics serves that very purpose by driving mass-scale processes empirically, guiding them with predictions generated from data. Millions of predictions a day improve decisions as to whom to call, mail, approve, test, diagnose, warn, investigate, incarcerate, set up on a date, and medicate. In this way, predictive analytics reinvents how our world’s primary functions are executed, across sectors. It boasts an intrinsic universality: A great, wide range of organizational activities can be improved with prediction–specifically, by way of predicting the behaviors and outcomes of people, the future of individual customers, debtors, patients, criminal suspects, employees, and voters. It’s that generality that makes this technology so potent and ubiquitous. Number one on LinkedIn’s “25 Hottest Skills That Got People Hired in 2014” is “statistical analysis and data mining,” and number six is business intelligence. While most of the other skills listed there are forms of engineering/development (programming, etc. ), the meat of the matter—the stuff of business—is what data itself tells us, rather than the infrastructures built to collect and store data. Research firms project the predictive analytics market to reach $5.2 to $6.5 billion by 2018/2019 (MarketsandMarkets and Transparency Market Research). Prediction makes our planet rotate a bit more smoothly. Let’s look at examples of this effect within six industries: Marketing, financial services, workforce management, healthcare, manufacturing, and government. As the table of resources below reveals, a great deal of movement deploying predictive analytics is taking place within each of these industries, as enacted by various companies for various purposes—each case executed by way of predicting an outcome or behavior (e.g., click, buy, quit your job, default on a loan, or die), and using those predictions to drive operational/treatment decisions (e.g., remarket to, call, give a raise to, decline credit to, or apply a medical procedure on). Follow the links within this table to check out in detail the areas that interest you most. 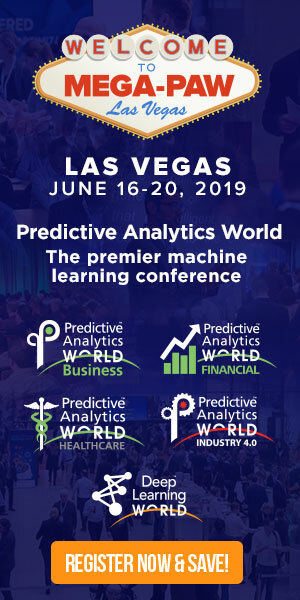 *PAW stands for Predictive Analytics World (vendor-neutral conference series). In response to market growth, PAW has expanded to 9 annual events and has launched specialized events that focus on the specific industries listed above. It does not stop there. Check out these other examples from the ever-widening range of industrial uses. … and as things warm up for the 2016 presidential election, speculation on the use of predictive analytics will emerge, given the way in which Obama for America 2012 used predictive analytics to target campaign activities. As I put it to a relative over the holidays, predictive analytics is a game-changer. It’s like Moneyball for… money. As predictive analytics’ adoption widens and deepens across sectors and across organizational functions, an inter-industry synergy emerges. Stories are shared between sectors–the lessons learned and proof-of-concepts viewed from neighboring industries inspire and catalyze growth. There’s a cyclic effect. And that is what the “big” in big data really means–big excitement and big impact across industries. Eric Siegel, Ph.D. is the founder of Predictive Analytics World— coming in 2016 to San Francisco, Chicago, New York, Washington D.C., London, and Berlin — the author of Predictive Analytics: The Power to Predict Who Will Click, Buy, Lie, or Die, and executive editor of the Predictive Analytics Times. For more information about predictive analytics, see the Predictive Analytics Guide. I think that one of the most important aspects concerning predictive analytics is to validate those things that cannot be predicted in the course of business, such that companies can create effective adaptive positions for optimal results. For critical issues, there is a vibrant market in options and futures. However, for many other idiosyncratic situations, companies would be well served to create their own risk insurance positions. The attempt to create a predictive model is a great way to confirm randomness and justify an adaptive posture. This negative result environment means that every industry can be changed by attempts at predictive analytics which calibrate management. One of the items that I think will drive Predictive Analytics in the future will be detection when a predictive model has lost validity and is actually hurting company performance. This change can be quite subtle, especially without calibration and control practices. I especially worry about when I am cornered by recommendation models such that I never even see a product that is the new optimal product for me, as I change my needs. I can feel it happening now as I am hunting for my new lab top online.